Middle Ages: a history packet - Fall of Rome to 1600 by Time Lines Etc. This packet has reference tables showing rulers of England and France as well as a principle-based study guide and date sheet. 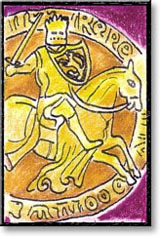 Click here for a Free Supplement of Art and Craft Ideas for the Middle Ages.